Whether you're looking for a role model for female students, a scientist to run a STEM workshop, or a speaker with some unique stories, please consider an author visit. I offer programs appropriate for school-aged children up through senior citizens, as well as science workshops for students and teachers. See Resources>For Writers tab for consulting and editing services. Use Book Orders tab for copies of my work. Kindle and out-of-print books are available via Marianne Dyson on AMAZON. 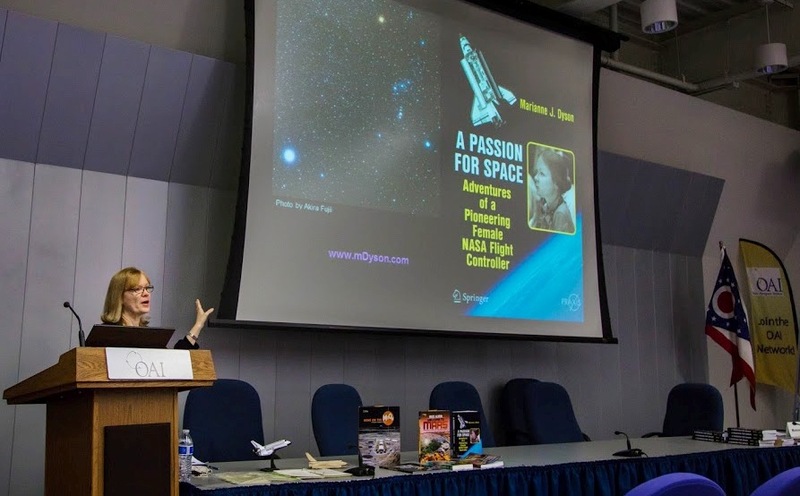 Sharing my passion for space with members of AIAA at NASA Glenn, 2016. Photo by Ed Wong/AIAANOS. 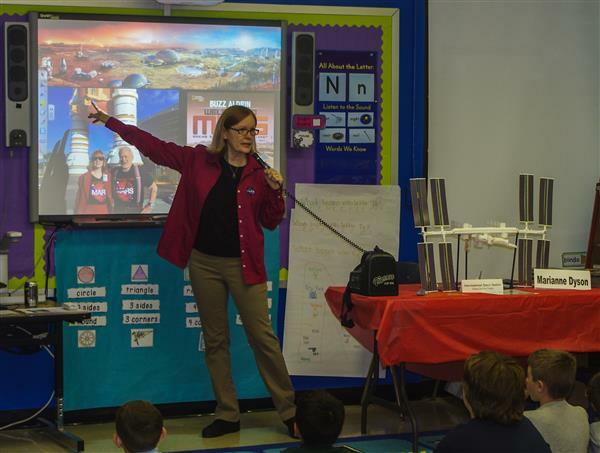 Author Marianne Dyson shares her personal experience earning a degree in physics and becoming one of the first women to join the problem-solving team in Mission Control prior to and during the first Space Shuttle flights. How did a girl from Canton, Ohio became one of the first female flight controllers for NASA? What do flight controllers really DO? Historical anecdotes exemplify both the humorous and serious aspects of preparing for Space Shuttle flights, dealing with multiple system failures, fighting the "glass ceiling" at NASA, and juggling work and family. Duration: one hour. Audience: grade 8 & up. 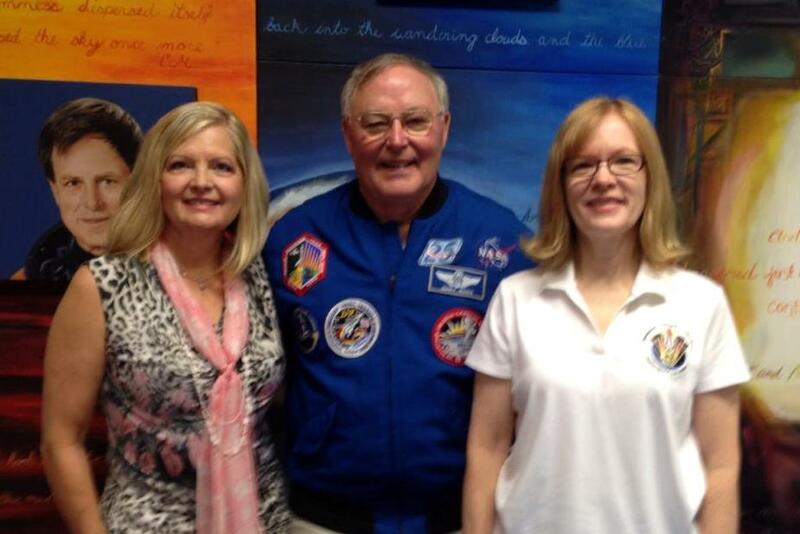 Author will provide a model of the space shuttle and historical artifacts for display. Get Ready for the Moon! It's been 50 years since the first humans ventured to the Moon. Are you ready to take your own lunar tour? 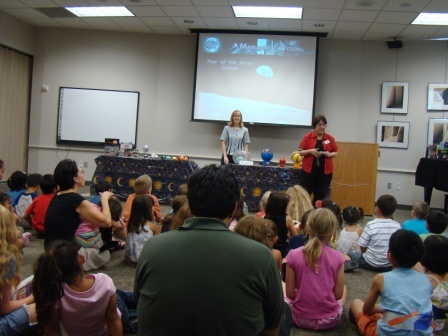 Presentation introduces adults and/or kids to the Apollo Program by taking them on a mock tourist trip to the Moon. Trip includes an orbit around the Moon to familiarize tourists with lunar geography and then covers the major reasons why people are heading to the Moon. 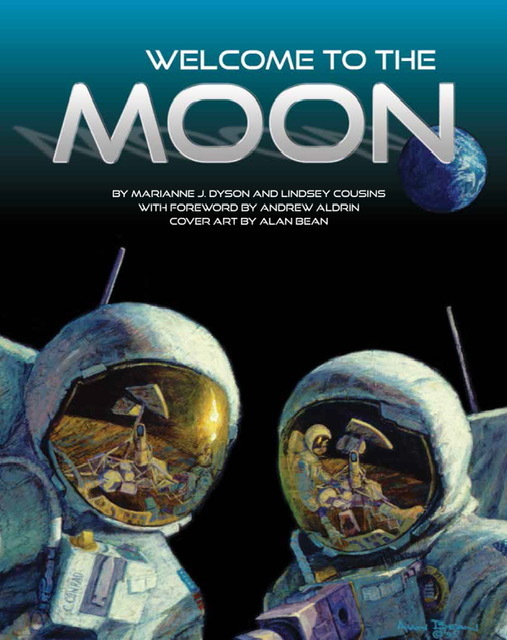 Spacecraft models, demonstrations, "pops" from the author's Apollo book, To the Moon and Back, help newcomers understand basic properties of the Moon and how its resources can be used to ensure humanity's long-term survival as well as for fun and profit. Weather and schedule permitting, presentation can be followed by a 15-30 minute trip outdoors to observe the Moon and/or night sky (with the telling of a few tall tales). This option is a fun activity "after hours" at conventions. With book stores closing, and Amazon controlling 80 percent of book sales, what options do authors have to publish and sell their work? What's the difference between traditional, academic/educational, and self-publishing in terms of reach and profits? Do you need an agent? What are the terms of a typical contract, and how can you avoid being scammed? What are the upfront costs? What goes into the proposal? How long does it take to publish a book? What will you be expected to do in terms of marketing? Science, technology, engineering, and math (STEM) workshops reinforce concepts and practice math skills. Activities taken from my books were tested by either Scholastic or National Geographic consultants. Others were developed by me for use teaching astronomy to gifted kids in the Clear Creek Independent School District's WAVE program. Catholic schools: I have a Safeguarding God's Children certificate. Please see tab above "Resources> for Writers" for writing workshop options. Dyson ready for launch in Orion! This workshop follows the format of a simulated space flight with a launch, orbit and landing phase. During the course of the workshop, eight questions are answered via activities: 1) Why does everything float in space? 2) What does it feel like to go into space? 3) What's different about meals in space? 4) How do you weigh a weightless rat? 5) How does fire behave in space? 6) How do you pick things up in space? 7) How do you return from space? and 8) Why does it seem heavier things fall faster? Duration is 3 hours with a short break in the middle. (Duration can be shortened a half hour by completing some activities at home using supplies/directions provided.) For student workshops, teacher must help supervise students. Max of two workshops/day with an hour break between workshops for reset and lunch. Audience: Maximum 20 students in grades 4 to 8, or teachers of those grades. Note, for local workshops, there is a $5/person supply fee. Host must provide water, copies of handouts, scissors, tape, and markers. Author can provide scale models for assembly by students. This workshop has participants compare living conditions on the Earth, the Moon, or on Mars in the future. It stresses scale modeling. Younger students can assemble models from parts precut or measured for them ahead of time while older students or adults can measure and make models using diameter, circumference, volume, distance/time, mass, and gravity data. Demonstration version takes about 2 hours, and Hands-On takes about 4 hours for adults, and longer for kids. 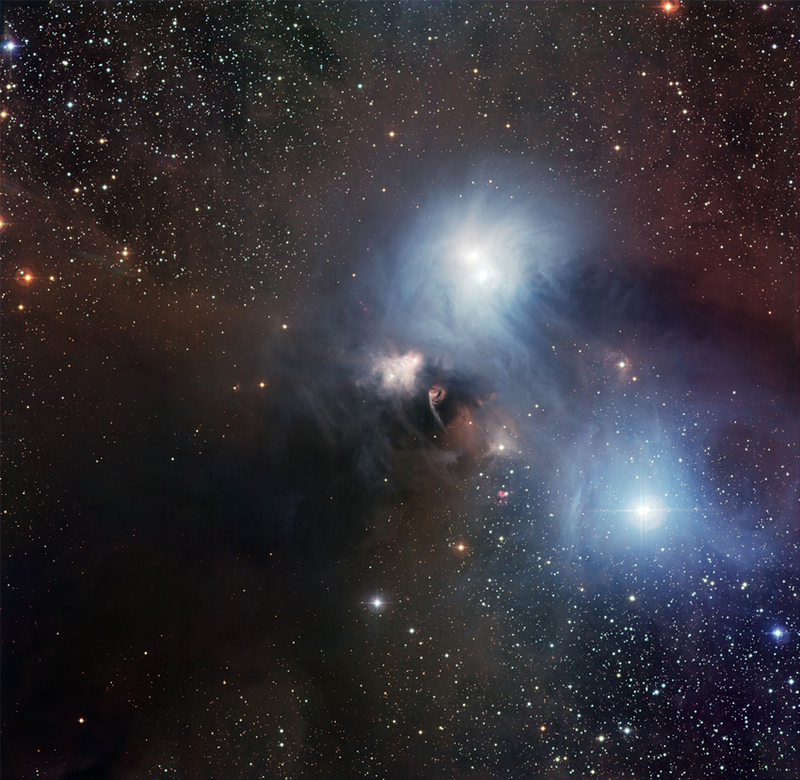 This workshop can be followed by the Living Solar System for a full day of teacher inservice. The workshop answers the following questions: 1) Where did the Apollo missions land? 2) How do the Earth, Moon, and Mars compare by diameter? 3) How far away is the Moon? 4) How far away is Mars? 5) Why is everything weightless in space? 6) How do the Earth, Moon, and Mars compare by volume and mass? 7) How much do things weigh on Earth, the Moon, and Mars? 8) How high/far can you jump on Earth, the Moon, and Mars? 9) Why are modules round in space? and 10) How might someone prove they were really on Mars? Duration is 3 hours. (Duration can be shortened a half hour by completing some activities at home using supplies/directions provided.) For student workshops, at least one teacher or parent must be available to help supervise students. Max of two workshops/day with an hour break between workshops for reset and lunch. Note for local workshops, there is a $10/person supply fee (because of PlayDoh!). Host must provide water, copies of handouts, scissors, tape, rulers, calculators, and markers. Living Solar System requires a gym or outdoor area. Participants create a solar system "May pole" with strings stretched from the sun at the center to cutouts of the planets (and major moons and dwarf worlds) to scale. They then walk the orbit of their assigned world and see for themselves how the worlds move relative to one another. Duration: 1.5 to 3 hours. This workshop takes 90 minutes using author's premade parts, 2 hours for a class to make one solar system (each participant assigned a planet) and use it, or 3 hours for teachers to make a complete set to take home and practice using it. Activity requires a gym, hotel ballroom, or unobstructed sports field or parking lot with enough room for a 40-foot diameter solar system. Max of 3 workshops/day with 30 to 60-minute break between workshops. Audience: Maximum 24 participants in grades 4 to 8, or teachers of those grades. For teacher workshops, there's an additional supply fee of $5/person. Host must supply scissors, tape, and markers for each participant. I live in Clear Lake near NASA JSC in southeast Houston. Therefore, I consider League City, Seabrook, Nassau Bay, and Friendswood as local. Please keep my location in mind when planning the time of your engagement. I would appreciate not having to drive in rush hour traffic! Thanks. Keynote or Special Topics: Price varies from all expenses paid plus a token honorarium to several thousand dollars, depending on the venue and audience. Opportunities to sell books are appreciated, but are not considered in lieu of honorarium. Please contact me by email to discuss specifics. Houston Area School Visits: $600 for a single presentation 30 to 60 minutes for afternoon or after-school events that require no more than a 4-hour commitment including drive time. For a single workshop, the cost is $800 plus any workshop supply fees. Price is $1000 for a full day of presentations or workshops for up to an 8-hour commitment. Discounts offered for additional days or repeat business in the same school year. Long-Distance School Visits: $1200/first day and $800 for each subsequent day plus hotel and transportation expenses for visits that require multiple hotel nights. Author can present up to four programs during one day or repeat one workshop twice. So, for example, I can fly in on a Monday night, address four groups of students on Tuesday, do two of the same workshop on Wednesday, and then fly out Thursday morning for $2000 plus travel expenses and workshop supply fees. Skype/Google HangOuts: I am willing to do short video chats with students or nonprofit or news organizations interested in interviewing me or discussing my published work. I charge $100 for 30-45 minutes (not including up to 15 minutes ahead of time to get the connection established and tested) between 10 AM and 5 PM Central time M-F. Add $50 extra for weekends or earlier/later times. 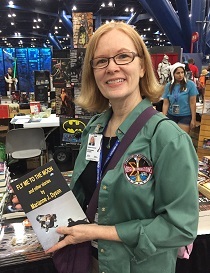 Local Houston: I usually bring a few copies of my most recent books for sale. I can accept cash or credit cards for purchases, and I have a Texas sales tax permit. Travel Visits: Books are heavy and bulky, so I will only bring books that are paid for in advance. Go to my Book Orders page and use the PayPal buttons for Local delivery (no postage) since I will bring them with me. Otherwise, you may order copies from Amazon ahead of time and bring them for signing. To Book an Appearance, Contact Marianne Dyson. Copyright © 2016-19 Marianne Dyson. Featured in cartoon and article by Dale Debakcsy on WomenYouShouldKnow.net, 5-31-17. Guest appearance on podcast The Space Show with Dr. David Livingston aired 11-14-16. 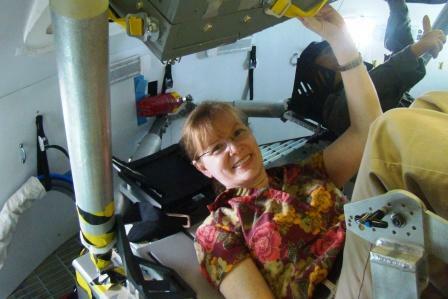 Radio interview, "From the Houston Spaceflight Center to Mars; the Journey of Marianne Dyson," aired 3-22-16 on MSONEWSSPORTS.com. Feature article by Brian Albrecht appeared in the Cleveland Plain Dealer, on 1-31-16 & 2-1-16. On Irish radio show Futureproof hosts Lara Dungan, Ian Brunswick, and I discussed The Martian. 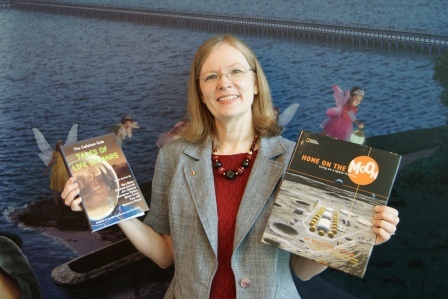 I was on NPR "To the Point" 7-08-11 with Warren Olney to discuss the last Shuttle flight. Hear the entire show, in four parts: Me & Architect Thom Mayne, Mayne & Astronomer Jonathan McDowell, & Me & McDowell. See more on my ARCHIVE page. Speaking at Westview School in Houston, May 2018. Addressing high school students at Laredo Public Library, May 2018. Dyson with Bruce Foster, artist for To the Moon and Back, at Houston Public Library, 1-18-18. Rice University Conference on Women in Physics. Harvard Elementary Literacy Night, October 19. Buzz Aldrin & I signed Welcome to Mars at Kennedy Space Center. I sold my first copy of The Callahan Kids (left) at the Seabrook Library's Authors & Ice Cream event in July. 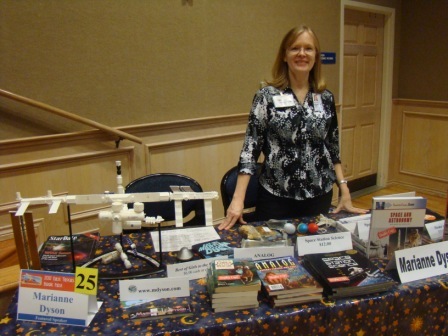 I was a featured author at the East Texas Book Festival in Tyler, Texas in September. 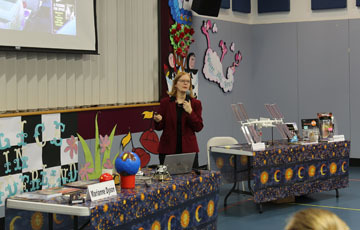 I toured the solar system with a capacity crowd at Freeman Memorial Library in Clear Lake in July. Bay City librarian Andrea Savage poses with me and (L to R) DeAsia Abbott, Jynesis Battle, Taniya Abbott, Sami Simons, and Kati Simons after my "Tour the Solar System" presentation. Harvard Elementary third graders compare the sizes of the planets in December. 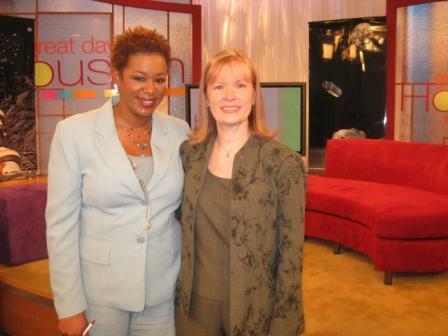 Me and Great Day Houston host, Debra Duncan, on the set 6-10-09. 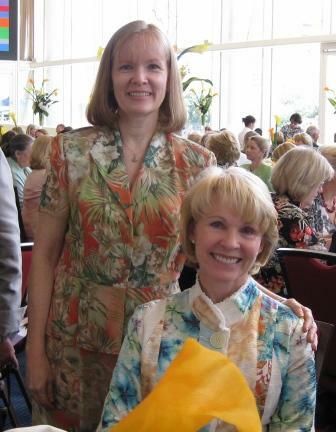 Me and former astronaut, Dr. Rhea Seddon, spoke at the annual Butterfly Luncheon in April. More photos in my ARCHIVE.